This could be a surprisingly contested award. For my sins, I’m a collector of old consoles and gaming platforms that I subsequently under-utilise. To put this in a bit of context, since I replaced my PC with something shinier and newer I’ve also rearranged my desk to support a couple of consoles. Both my PS2 and my 3DO are connected to the LCD TV that used to serve as my primary monitor, before I snagged myself a 1920 x 1080 Dell widescreen. Neither the PS2 nor the 3DO get used much. The 3DO is waiting for me to burn to disc copies of CPU Bach (because it sounds fascinating) and Plumbers Don’t Wear Ties (because it sounds awful and amusing). The PS2 was last used to play the naff Fallout: Brotherhood of Steel. Over in the living room, there’s a RetroN 5 that doesn’t get used enough. Copies of old games I want to check out like The Corporation (Mega Drive) and MechWarrior (SNES) live near it, but even these tantalising carrots aren’t enough to guarantee that I’ll rearrange some HDMI cables and actually play the bloody things. So with stiff competition like this, what could possibly win this, er, highly coveted award? 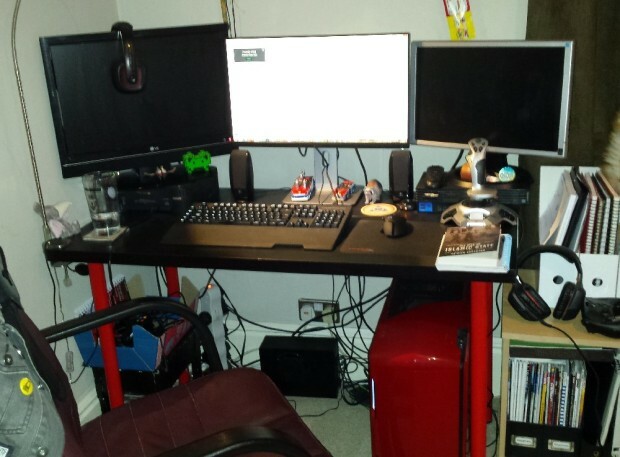 Pro tip: don’t buy a black desk. It’s annoyingly hard to see anything, except the dust. 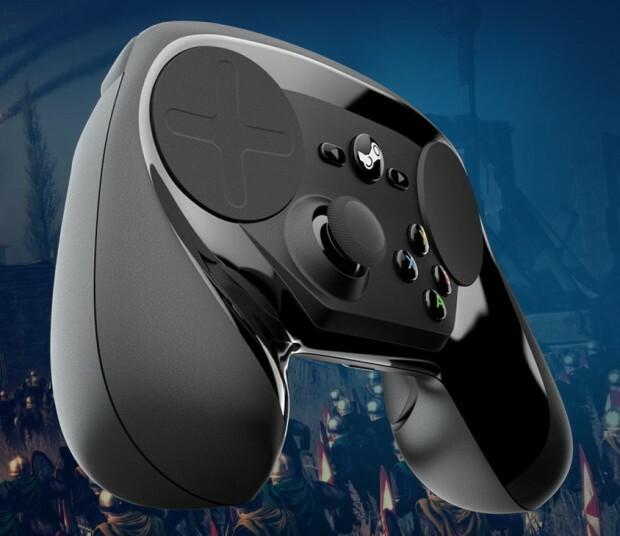 That’s right, it’s the only thing it could ever have been circa 2015: the Steam Controller. As a principle rendered in plastic and silicon I like the Steam Controller a lot. I regard it as essentially a mass-manufactured prototype; the first in a range of devices intended to bridge the divide between the conflicting and complementary orthodoxies of mouse-and-keyboard and twinstick controller. It was always unlikely that Valve’s first generation of plastic lump would revolutionise human-computer interaction in gaming, but it’s an intriguing effort to evolve a hybrid middle ground. Further, as a device it’s full of potentially neat ideas. The dual-stage triggers potentially offer greater finesse for what, in many controller-led games, are mapped to core gameplay verbs. The back-mounted pull buttons are naturally placed and feel ideal for mapping to any number of regular secondary or tertiary commands. The moulding of the controller is unusual, but to my average-sized hands and fingers feels comfortable and natural. The touchpads with their haptic feedback and the moulded DPad on the left pad are the best attempt I’ve encountered to address the ‘virtual controller’ problem that will be familiar to anyone who regularly plays action games on touchscreen phones or tablets. Unfortunately, I’ve barely used the bloody thing. It did have the misfortune to arrive the same week as Fallout 4; in fact it arrived the same working day as my botched ‘preload’ completed (thanks, Funstock Digital, for your shoddy handling of that particular set of pre-orders). I briefly tried to use the controller at work, but it turned out to not support Mac OS at that time. I then tried to use the controller with Fallout 4, but almost immediately realised that it was ill-suited to the settlement construction and management features Bethesda had introduced. That’s a jolly good idea, I thought. And subsequently did not do so, absorbed as I was by Fallout 4. I still like the idea of the Steam Controller, and still plan to use it. I would hate to de facto become one of the many, many early adopters who picked one up, tried it once or twice, and then shelved it forever because it just didn’t click for them. It’s clear to me that getting competent with the Steam Controller is going to require as much time investment as an inveterate PC gamer who picks up a DualShock for the first time, or someone who has played on consoles their entire life trying to get to grips with the mouse-oriented UI of a deep PC strategy game. It has the scent about it of paradigmatic shift, and that is a demanding fragrance. What the rewards of such investment will actually prove to be I cannot say, but I’m determined to find out for myself. However, I’ve not done so yet, and so the Steam Controller receives my 2015 award for most underused hardware. Now if you don’t mind, someone gifted me a copy of Downwell, so I’m going to go try that out with my Steam Controller. It’s 2016, don’t you know. Would you just look at this consumer object’s salacious curves. I think this is when a ‘lol’ is required.